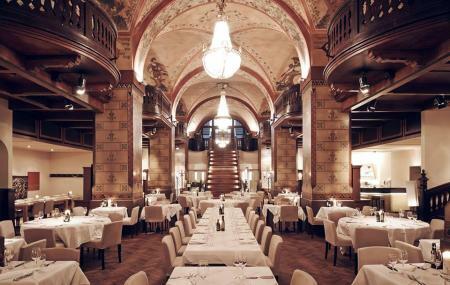 A brilliant example of Bernese Baroque architecture and design, posing as a gastronomical heaven is a restaurant by the name Kornhauskeller. Located right in the middle of the city of Bern, the restaurant is famous for not only its architecture and design, but also for the elegant, yet lip-smacking food. A great blend of an archaic structure and fine dining, this place is sought by all tourists, and most of all by local people! Kornhaus was built between 1711 and 1718. Made from sandstone, this unique historic building proudly serves the best, most authentic, traditional Italian food. The restaurant also has a bar that offers traditional as well as unique beverages that are exciting. So, go ahead and plan a special evening with your special one, and enjoy this luxurious partnership of food and drinks. The bunker has been sealed and not open to a tour. Winter months- Midday opening hours are extended on weekends. Summer months : Closed during the day on Sundays. For me the Kornhauskeller is one of the best restaurants in town. It's not the cheapest place for sure, but the food is very delicious and the atmosphere down in this amazing building is also very impressive! All together is absolutely worth a visit for everyone who likes great food and atmosphere and ready to pay the little extra for it. Food good, great wine, but beware that you do pay a premium for the amazing location. Service was not up to standard of the prices, but very friendly. All in all, worth a visit just to dine in the amazing atmosphere of the high ceiling cellar. Stopped here for drinks. It was tasty and the place had a really cool vibe. If I was in Bern I'd stop back here to take a chance at dinner. Really cool place. A very classy place to eat and drink, wouldn't expect this underground. Very recommendable. Well worth a stop at the Gallery Bar for a drink, even if just for a beer, but recommend getting a cocktail. Google said it was closed on Monday, but it was open on the night that I went. You will go down a flight of stairs to get to the bar and then it is a second flight down to the restaurant.